A general arrangement of a typical bulk carrier shows a clear deck with machinery aft. Large hatches with steel covers are designed to facilitate rapid loading and discharge of the cargo. Since the bulk carrier makes many voyages in ballast a large ballast capacity is provided to give adequate immersion of the propeller. 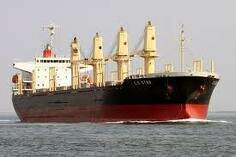 The general-purpose bulk carrier, in which usually the central hold section only is used for cargo. The partitioned tanks which surround it are used for ballast purposes either on ballast voyages, or in the case of the saddle tanks, to raise the ship's center of gravity when a low density cargo is carried. Some of the double-bottom tanks may be used for fuel oil and fresh water. The saddle tanks also serve to shape the upper region of the cargo hold and trim the cargo. Large hatchways are a feature of bulk carriers, since they reduce cargo-handling time during loading and unloading. Bulk carrier general arrangement and size range are similar to that of tankers, as shown in Figure . Single-purpose bulk carriers are generally designed as ore carriers, built to carry heavy cargoes stowing at 25 cubic feet per long ton or less, or dry bulk carriers, for grain and similar cargoes stowing at 45 to 50 cubic feet per ton. Like tankers, the general arrangement of cargo spaces is dictated by the facts that the cargo is in the form of homogeneous particles of more or less uniform size, and can be transferred by blowers, conveyors, or grab buckets. Cargo spaces are divided into holds to meet structural and subdivision requirements, to restrain cargo movements and resulting upsetting moments, to permit the carrying of different cargoes simultaneously, and to provide for ballasting. Machinery is invariably aft, and the nonperishable nature of the cargoes leads to speeds in the 12- to 16-knot range, with attendant full hull forms. Relatively small volumes of dense ores and similar cargoes will settle a ship to her summer load line. Holds on ore carriers are therefore quite small, bounded by broad wing tanks and deep double bottoms. The double bottom and longitudinal bulkheads are of heavy construction to carry the heavy ore load. The narrow hold breadth limits transverse weight shifts and the depth of the double bottom is sufficient to keep the center of gravity of the ore high enough to prevent stiff rolling in a seaway. Large volume wing tanks are used for ballast. Designed for low-density cargoes, dry bulk carriers require much greater hold volume than ore carriers, and therefore have much shallower inner bottoms . In some designs the topside tanks are omitted or fitted with bolted plates in the sloping plating facing the hold. When very light cargoes are carried, the plates are removed and the tanks are filled along with the hold; the cargo in the tanks feeds into the hold by gravity when discharging. Larger carriers are sometimes built with an inner side shell, which eases hold cleaning and provides additional ballast space. Shallow double-bottom bulk carriers are sometimes designed to carry high-density cargo, by arranging them with alternate long and short holds. High-density cargo is loaded only in alternate holds to keep the center of gravity high enough to prevent excessive metacentric height. The double-bottom structure under the holds intended for heavy cargo is augmented. The alternating cargo distribution causes high vertical shear near the bounding bulkheads, which may require increased shell scantlings. With the increase in industrial demand for raw materials paralleling that for petroleum, the design of bulk carriers, like tankers, also evolved to include larger hulls. Bulk carrier deadweights range from quite small to over 200,000 tons. i) Single cargo deck, without ’tween decks. ii) Machinery aft of cargo spaces so shaft tunnel does not interfere with discharging gear. iv) Double bottoms under bulk cargo holds. i) Cargo will flow outwards from the point of discharge of bucket grabs or gravity chutes to fill the entire cargo space with a minimum of hand trimming. ii) The narrowing width at the top of the hold limits transverse cargo shifts when the hold is not completely filled. iii) During discharge, remaining cargo will flow to a fairly small area where it can be picked up by the discharging equipment. Holds of different lengths may be distributed throughout the length of the ship for flexibility in cargo distribution; cargoes of varying densities can be distributed so as to keep the longitudinal bending moment within acceptable limits. Except for equipment to open or remove hatch covers, most bulk carriers are without cargo gear. Cargo is loaded by gravity chutes or derrick grabs and discharged by grabs, conveyor systems, or in the case of grain and similar light cargo, by suction. Some bulk carriers are built as self unloaders, either by the provision of derrick grabs, or by trimming the cargo spaces to belt conveyers running under the holds to a bucket conveyer which transfers the cargo to another belt conveyor on a long unloading boom. Conveyor type self-unloaders are fairly common on the Great Lakes . Combination carriers are fitted with cargo pumps and piping systems for discharging oil cargoes.